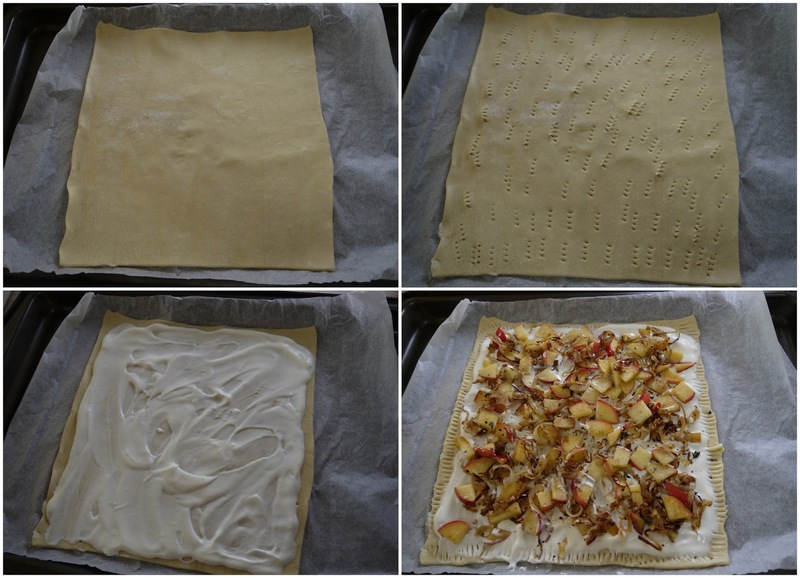 If I've learned one thing from my Tart of the Month series, it's this: Keep frozen puff pastry on hand and you can whip up a tart for dinner, breakfast or appetizers any time. We are moving to a new house at the end of the month so we have been very busy for a while now. So this tart is extremely easy and uses ingredients we always have on hand. It's just apples, onions, sour cream and puff pastry. Slice the onions. The best tip I've ever heard about caramelizing onions is to make sure they're sliced as uniformly as possible so they cook evenly. Using a mandoline or food processor can help with this. Cook the onions in butter or oil for about 15 minutes, stirring, until golden brown and caramelized. Season with salt and pepper. Cut the apple into slices, then cut the slices into thirds to make small pieces. No need to peel the apple! I told you this was easy. Add the onions to the pan with the onions and cook for 2 minutes. Season with salt and pepper. Place the puff pastry on a sheet of parchment paper on a baking sheet. Use a fork to pierce the pastry all over. This prevents it from puffing up in the oven. Spread the sour cream over the pastry, leaving a border around the edge. Tumble the caramelized onions and apples over the pastry. You can use a fork to press the edges of the pastry to make a nice crust. Bake the tart for 45 minutes until pastry is golden. Slice the tart and enjoy!